Our Tapped Hole Drilling & Reaming Machine are manufactured from quality raw material and are easily available at very reasonable price. These machines are known for their unbeatable performance. These are used to reduce operators fatigue by automatic location, clamping of crank case. Automatic loading & unloading of crank case into fixture (Pneumatic). Automatic location of crank case – Hydraulically Operated Retractable Round & Diamond Pin Locator. Automatic movement of Bush Bar into Cam Bore, & its automatic orientation. Pneumatically operated index slide table to index fixture through 550 mm. Hydraulically operated crank case lowering & lifting to lift to clamp. Fully auto cycle for drilling & reaming. PLC based electrical & hydraulic controls. 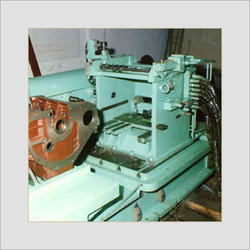 Looking for Tapped Hole Drilling & Reaming Machine ?